Thompson Smith and Puxon (TSP) Personal Injury and clinical negligence solicitor, Clare Sheeran, successfully completed the Colchester Half Marathon in an impressive time of 2 hours and 16 minutes despite the wet weather. The race took place on Sunday 29th March and was organised by Colchester Colne Round Table in association with Headway Essex. All of the proceeds from the race, entry fees etc. will be donated to Headway with runners then able to raise money for a charity of their choosing should they wish to do so. Clare has been raising money for Breakthrough Breast Cancer which aims to stop breast cancer for good by improving early diagnosis, developing new treatments and preventing all types of breast cancer. Clare says ‘Breast Cancer is something that has affected my family significantly. My Mum was initially diagnosed with the disease over 34 years ago and has continued to fight it on and off over the years. Sadly, two and a half years ago it returned and this time has spread to other organs. She continues to fight and has the best care provided to her from an incredible Consultant who works tirelessly with Breakthrough Breast Cancer to improve treatments and keep patients, including my Mum, alive, and with some quality of life for longer’. 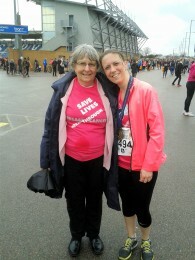 Clare (pictured at the end of the race with her mother Maureen Sheeran) has managed to raise a whopping £750.00 so far, well over her target of £500.00. Well done Clare!